Corruption hurts. But how much? Corruption hurts: Who, where, how much? 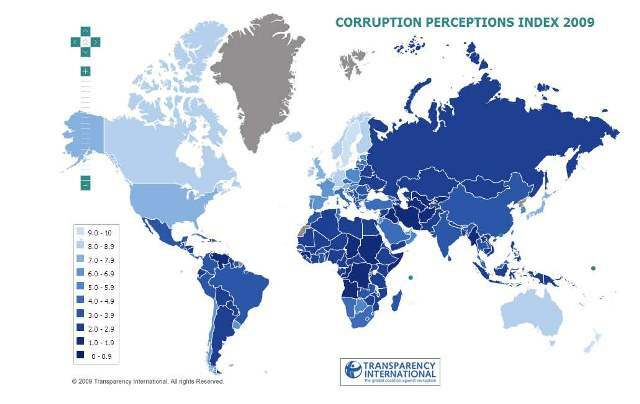 “Corruption hurts everyone, and it harms poor people the most.” That basic principle underlies the work of Transparency International [TI], the Berlin-based international group whose mission is nothing less than helping to create a world free of corruption. bring[s] together relevant players from government, civil society, business and the media to promote transparency in elections, in public administration, in procurements and in business. TI’s global network of chapters and contacts also use advocacy campaigns to lobby governments to implement anti-corruption reforms. That definition incorporates virtually everyone. But it’s especially relevant to poor people, whose daily scramble to survive depends greatly on local, regional and national governments, and on aid organizations. In fact, says TI, corruption is both a cause of poverty, and one of the biggest barriers to overcoming it. Most Americans would probably claim personal innocence from political corruption. Sure, we acknowledge that it exists, but we often cynically dismiss corruption-fighting as a battle against the worst of human nature. Mostly, we see corruption as an abstract concept that applies to others, and we easily dismiss it as irrelevant to our daily lives and more pertinent to Jack-Abramoff-type lobbyists and politicians who hide shoeboxes full of cash payoffs in their closets. Of course, we’re kidding ourselves. Corruption is everywhere in many forms—both obvious and subtle. And for many people around the world, corruption is a daily routine—one that limits their lives in many ways. A father who must do without shoes because his meager wages are used to pay a bribe to get his child into a supposedly free school. The unsuspecting sick person who buys useless counterfeit drugs, putting their health in grave danger. A small shop owner whose weekly bribe to the local inspector cuts severely into his modest earnings. The prosperous multinational corporation that secured a contract by buying an unfair advantage in a competitive market through illegal kickbacks to corrupt government officials, at the expense of the honest companies who didn’t. Post-disaster donations provided by compassionate people, directly or through their governments, that never reach the victims, callously diverted instead into the bank accounts of criminals. The faulty buildings, built to lower safety standards because a bribe passed under the table in the construction process that collapse in an earthquake or hurricane. eptions Index [CPI], which measures the perceived level of public-sector corruption in 180 countries and territories around the world. The most recent CPI, released in 2009, ranks Somalia and Afghanistan as the countries perceived as most corrupt, while New Zealand and Denmark are perceived as least corrupt. On the CPI scale of 0-10, with 10 being the lowest level of perceived corruption, the US gets a 7.5, compared to New Zealand’s 9.4 and Denmark’s 9.3. The vast majority of the 180 countries in the 2009 CPI score below 5. TI observes that countries perceived as the most corrupt tend to be those that have been torn apart by wars and internal strife. The Bribe Payers Index [BPI], which evaluates the “supply side” of corruption—the likelihood of firms from 22 industrialized countries to bribe abroad. The BPI gives ratings from 0 to 10, with 10 indicating the least likely to bribe. In the most recent BPI, published in 2008, Belgium and Canada shared first place with a score of 8.8. At the other end of the spectrum, Russia ranked last, with a score of 5.9, just below China [6.5], Mexico [6.6] and India [6.8]. These indices tell us a lot—perhaps more than we care to know—about the world we live in. Obviously, no country is without corruption. The differences are only in degree. What TI is doing may not end corruption or change human nature, but by raising our awareness, it might help us face reality and take action.